Instead of £1,510.00. You save £75.50 due to the online discount . 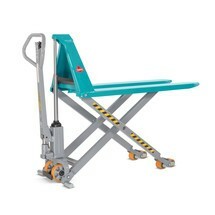 The electro-hydraulic Ameise® scissor lift pallet truck delivers reliable Ameise® quality and enables ergonomic working. Thanks to the 0.8 kW lift motor, you can raise loads of up to 1000 kg quickly and effortlessly – all at the touch of a button. The scissor lift pallet truck is a real all-rounder and can be used as a hand pallet truck, lift table, provisioning table or workbench. You can also call upon the manual lift function with separate quick lift facility. 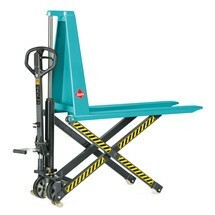 This scissor lift pallet truck offers robust Ameise® quality for daily use in a wide range of applications. 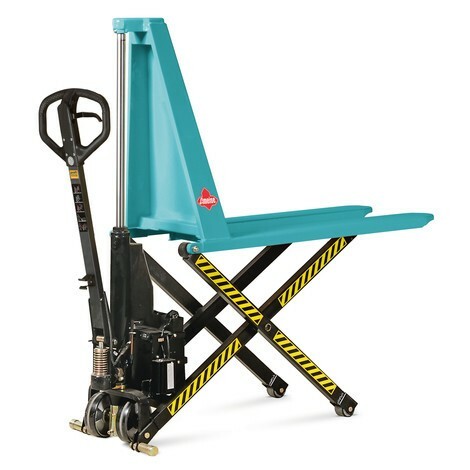 As a combination between a pallet truck and lift table, it can be used as a tool for lifting, moving and provisioning your transported goods. 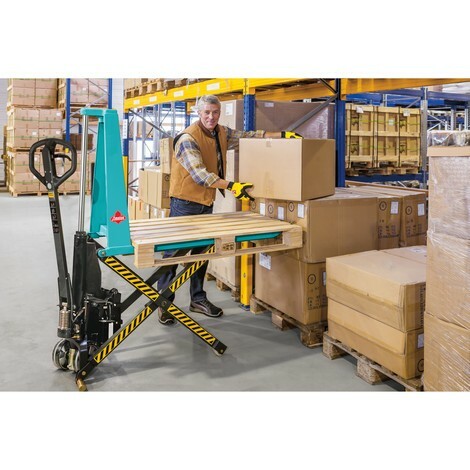 With the electric lift, you can easily raise loads weighing up to 1000 kg to an optimum height, allowing you to work in an ergonomic, fatigue-free manner. 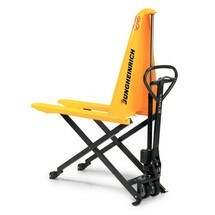 You can adjust your perfect working height up to a maximum of 800 mm. The truck can be moved up to a lift height of 400 mm. At greater heights, side-mounted support feet secure the scissor lift pallet truck to ensure maximum stability and safety. 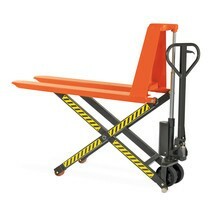 You can then use the scissor lift pallet truck as a workbench to replenish machines or stack and retrieve stored materials. All functions are easily operated via the control lever or the ergonomic plastic tiller handle. 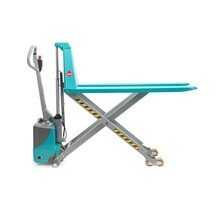 The load is lowered at an adjustable speed, allowing you to deposit sensitive goods with utmost control and precision. The welded sectional steel frame and forks are torsion-free and extremely hard-wearing. 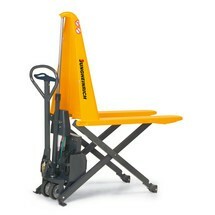 As a result, the scissor lift pallet truck retains its shape even when carrying loads of up to 1000 kg. 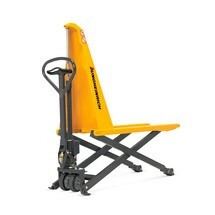 The single-cylinder telescopic hydraulic system is particularly durable and maintenance-free. The overload valve protects the hydraulic system against excess loads. Thanks to the on-board charger, you can charge the maintenance-free 12 V / 60 Ah battery at any 230 V socket. And if you do not have access to a power source, you can still use the manual lift function with separate quick lift facility. The truck features polyurethane steering castors for high-quality, comfortable and low-noise travel, while also offering maximum capacity and a long service life. The single fork rollers are made from nylon and are thus very smooth running and wear-resistant. Enjoy ergonomic working by ordering the versatile Ameise® scissor lift pallet truck with electro-hydraulic lift from our shop.